Birmingham Ridge- Mr. Horace "Mutt" Milton Miller, age 87, died peacefully on Friday, March 29, 2019 at Sanctuary Hospice House. Horace was born on April 25th, 1931 to Eugene Miller and Gladys Haddon Miller, was a lifelong resident of the Birmingham Ridge Community and a 1949 graduate of Saltillo High School. Upon graduation he patriotically served his country in the United States Army during the Korean Conflict. "Mutt" retired from South Central Bell (BellSouth) in 1984. He was a 32nd Degree Mason and a member of the Saltillo Masonic Lodge 294 for 60 years. Mr. Miller was an avid hunter, fisherman and amateur archaeologist. Throughout his life he enjoyed truck-patch farming and bee-keeping. He was known to all as a prolific storyteller and "could talk the horns off a billy-goat". 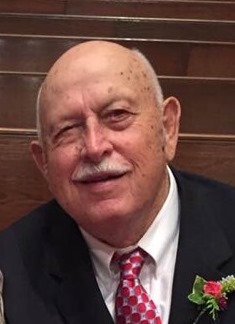 Mr. Miller was a longtime member of Birmingham Ridge Baptist Church. He married Joyce Winders on March 31, 1956 in East Tupelo and shared 63 years of happiness. Horace was a devoted husband, father, and grandfather affectionately known as "Pops". A celebration of his life and homecoming with military honors will be at 4:00 P.M., Sunday, March 31, 2019 in the Tupelo Chapel of Holland Funeral Directors with Brother Tommy Winders officiating. A private burial will follow in McNeil Cemetery. Visitation will be Sunday from 2 PM to service time. Survivors include his wife, Joyce Winders of Birmingham Ridge; son, Bradley Ecford Miller and his wife, Sherry, of Saltillo; daughter, Susan Miller Cole and her husband, Nelson, of Saltillo; four grandchildren, Meredith Miller Sessums (Robert), Emily Miller Brandon (Toby), Casey Cole and Miller Cole. He was preceded in death by his parents and two sisters, Magdalene Easterling and Mavis Street. Pallbearers will be: Thomas E. Counce, Jr., Toby Brandon, Robert Sessums, Chuck Thomason, Steve Thomason, and Steve White. In lieu of flowers, the family request memorials be made to Sanctuary Hospice House, P.O. Box 2177, Tupelo, MS 38803. The family would like to extend a special thank-you to a special caregiver, Helen Gables, and to the staff at Sanctuary Hospice House for their compassion and constant loving care of Mr. Miller during his stay. Condolences to the family may be posted at www.hollandfuneraldirector.com. For those unable to attend, the service may be viewed at 4:00 P.M.